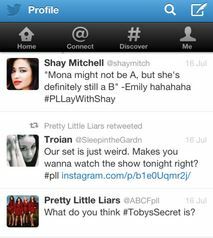 Pretty Little Liars, an ABC Family TV show, has taken Twitter to another level. This may explain their continued success with viewers. The show is about four high school girls who try desperately to find out who killed their best friend Allie. However, the girls are not alone throughout their quest. 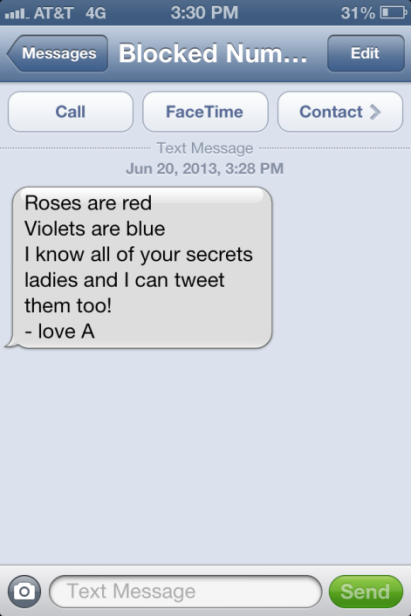 An evil being who the girls only know as “A” has begun terrorizing them through text messages. Though the girls despise “A” they must obey “A's” demands to avoid the exposure of their own secrets. The producers of Pretty Little Liars use Twitter as a feedback mechanism. Viewer tweets allow them to recognize if a new character is liked or disliked by fans. Fans can also express how they feel about a new twist in the show. Tweets from actors on the show. The cast of Pretty Little Liars also have their fun in the Twitter world. During episodes they will engage in “live-tweeting" with the fans. The cast, however, never give out any spoiler alerts; just enforcing the current action that is taking place. The "live - tweeting" action gives fans and cast a surreal connection which replaces the typical dull connection that is established through a TV screen. The plethora of crazy twists, mysteries, and OMG moments make the show a social-media hit. What takes Pretty Little Liars over the top is their clever use of Twitter. The lack of fear the producers and cast have for social media provides them with immediate feedback and a phenomenal fan base connection. Pretty Little Liars takes you into the mind of young adults and how twisted life can be and I think “A” would approve, don’t you? You can find out more information about Pretty Little Liars on both Facebook and Twitter or on their website. Kendyl Adams is a speech communications major and current TSMRI Intern who will graduate from Tarleton State University in May of 2015.